A few weeks ago, my family and I had the opportunity to take our very first family vacation together. We decided to take the girls to Punta Cana in the Dominican Republic, where hubby and I went on our honeymoon almost nine years ago. I hate to say it, but that was our last real vacation. So much has happened since then! I finished my degree, changed jobs twice, we bought a new house, and then along came these two little girls! I just felt the kids were too young. Who wants to fly with a baby? What will we do with the kids when we’re there? I’ve been wanting a relaxing all-inclusive vacation on a tropical beach for years, but it’s not a vacation if I’m constantly chasing my toddler around to stop her from drowning herself. A friend suggested looking into a resort with a kids club. Someone to watch and play with my kids for a while so I can actually relax by the pool? I like that idea! Almost all the places I looked at only offered childcare for older kids though. Five years old or sometimes four and up. Well, that wasn’t very helpful to me. And then I saw a mention of an all-inclusive resort with a Baby Club on TripAdvisor. 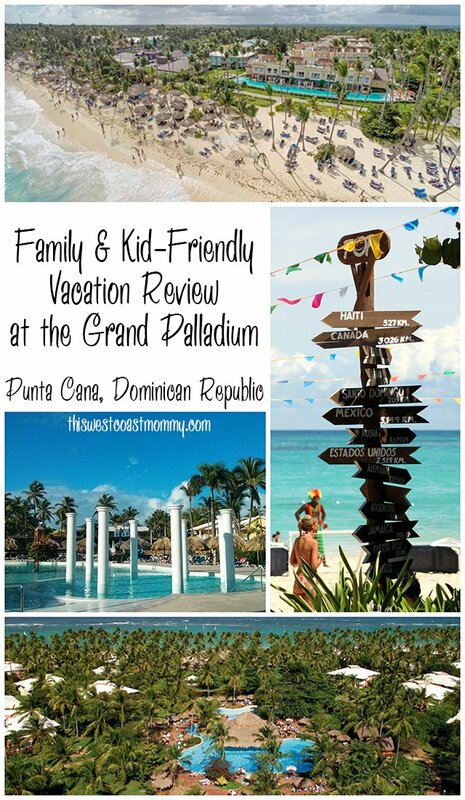 In Punta Cana, where we wanted to go, the Grand Palladium Resort Complex caters to families with children of all ages, including babies and toddlers. I knew that was where I wanted to go! There’s so much to talk about that I’ve broken it into two parts. In this first part I just want to share a little bit about what you can expect at the resort itself. 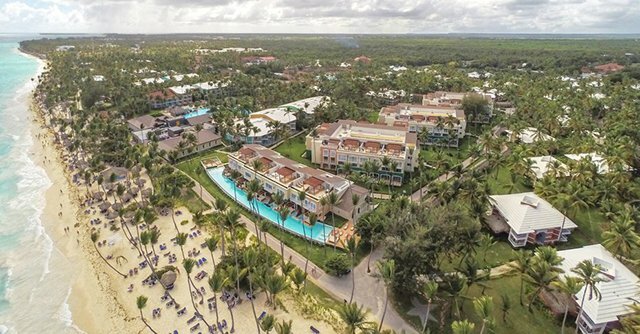 Like many of the larger hotels in the Caribbean, the Grand Palladium is actually a huge complex of several smaller resorts: Grand Palladium Bávaro Suites Resort & Spa, Grand Palladium Palace Resort Spa & Casino, Grand Palladium Punta Cana Resort & Spa, and The Royal Suites Turquesa by Palladium. 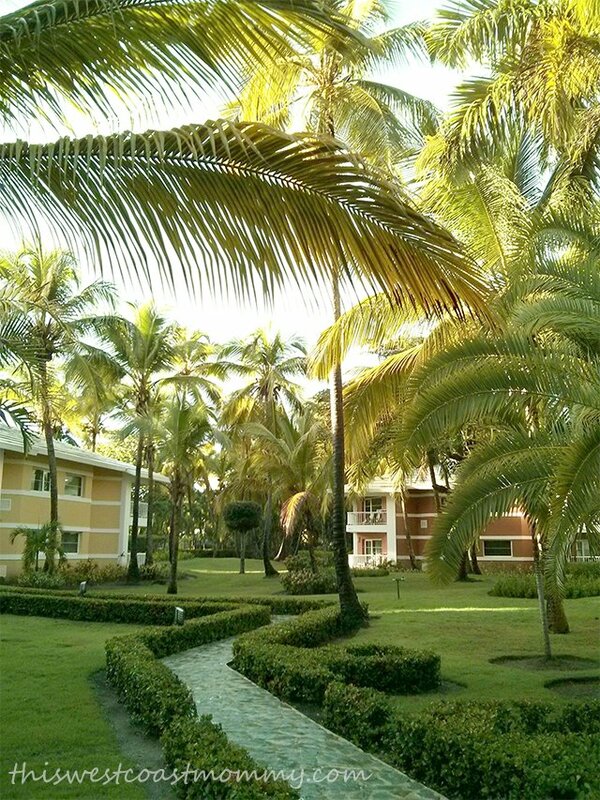 We stayed in the Bávaro section which is a little quieter, but still close to the Baby Club and Kids Club. After a long, exhausting plane ride and a 30 minute cab ride from Punta Cana International Airport, we were greeted with cold drinks for everyone. Check-in was quick and friendly, and we got a mini tour of the extensive complex during the golf cart ride to our room with our luggage. The beautiful grounds were clean and well-maintained, and despite several days with periods of heavy rain, we barely noticed any mosquitoes. Fortunately, the rains rarely lasted longer than an hour or so, and it was a good time to grab a snack at one the buffets of the snack bar. All the staff, including the maintenance crew, were warm and incredibly friendly. We saw someone trimming back coconut trees after one of those rains I mentioned, and when he saw the girls watching him, he climbed down to give the girls a fresh coconut and their first taste of coconut water. We stayed in a Family Master Junior Suite with two double beds and a fold out couch. The girls don’t share a room at home, but they were pretty excited about sharing a bed on vacation. Our room came with a play tent and kids table, and the kids moved half of their stuff into the tent the moment we stepped into the room. Image courtesy of Grand Palladium Hotel Group. Our room was clean and cool, and we were greeted by robes, slippers, pretty towel swans, and fresh flowers when we came in. Aaah! The extra large bathroom had a big jacuzzi tub, separate shower, and screened off toilet area. With a family of four, the extra space was really nice! The room also had a flat screen LCD TV and a fully stocked mini fridge, but honestly we didn’t spend much time in the room. For families with even younger children, the Grand Palladium offers a Family Kit add-on where parents can order a la carte supplies like baby food, diapers, and formula. Our bathroom also came with a baby bathtub, a potty, and a smaller toilet seat to adapt the toilet for bitty bums so they don’t fall in. 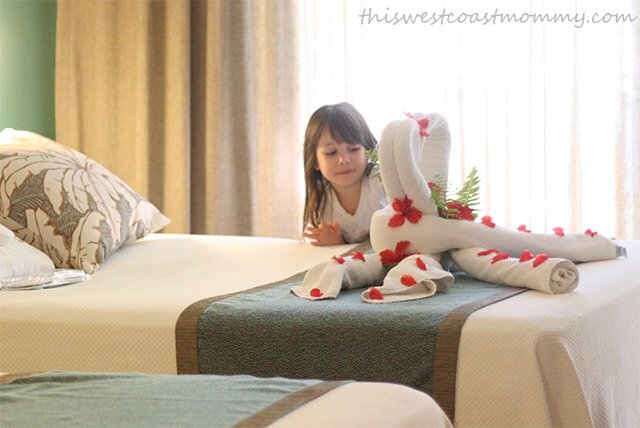 It’s those little touches that made the room and resort so welcoming for us and the kids. The Grand Palladium has tons of other rooms of course. 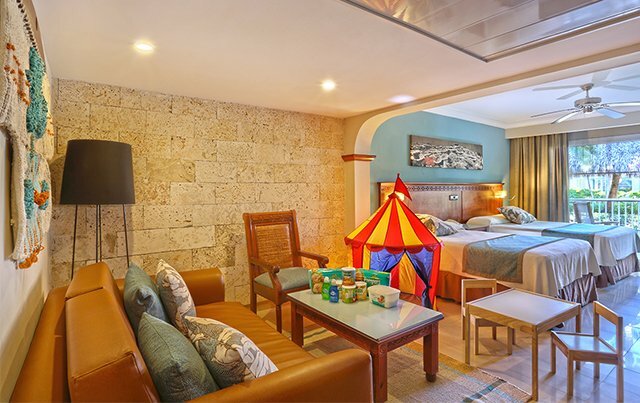 Best bet for families are the junior suites which come with a little extra room for comfort’s sake. Next time I’d love to stay in one of the swim up junior suites and relax in the private pool right outside my deck! The resort boasts four main pools, the pirate ship themed kids pool, and another three pools in the Grand Turquesa section, one of which was for adults only. 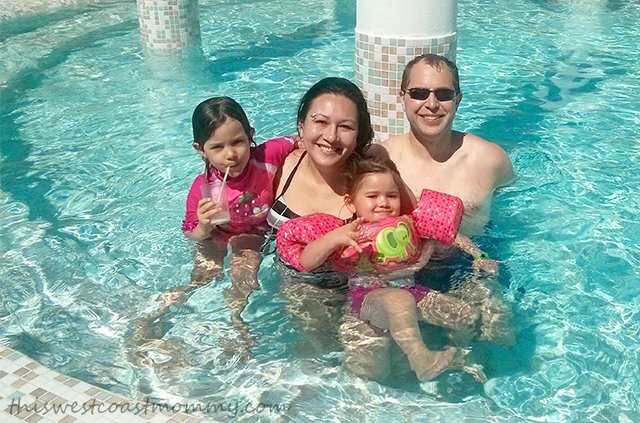 We spent most of our time at the main pool by the Kids Club in the Punta Cana section of the resort. The shallow end was about three feet deep so it was just the right depth for Tee to learn how to hold her breath underwater and practice her floating. By the end of our ten day vacation, she had learned to swim about eight or nine feet before having to put her feet down. I was so proud, but you should have seen how proud she was of herself! At three years old, Kay wasn’t tall enough to touch the bottom so she wore her floaties and stayed close to one of us while she happily splashed around. I love how comfortable she was in the water – I have two little ducklings it seems! Each pool has a swim up bar and a mini jacuzzi area. Most of the pools close at 7:00 pm (when it gets dark), but one adult pool was open until midnight. I’m sorry to say we didn’t get the chance to grab a late night swim, but it was nice to know the option was there. We never found the pools overcrowded, and we were always able to find at least two loungers. At other resorts I’ve been to (even in off-peak season) you need to get up ridiculously early to “reserve” a lounger with a towel, but we never had to do that here. 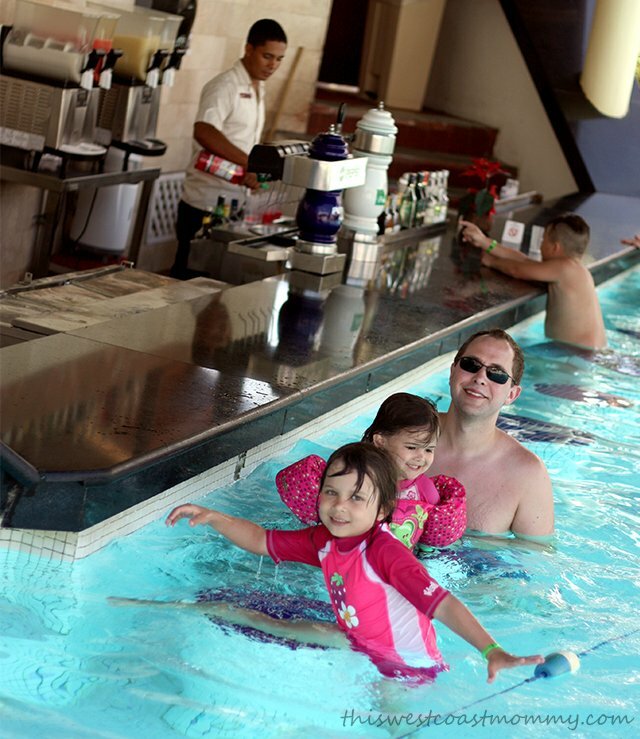 Staff regularly walked around the pool checking on our comfort and keeping our drinks refreshed. The one annoying thing was the people approaching us to sell dolphin swim excursions. The resort also allows locals to bring in pop-up jewelry stands all across the grounds on Mondays and Fridays. I’m a true Canadian girl, eh, so the first few times I tried to be polite and listen to the salespeople’s pitch, but then I realized I was spending far too much time explaining all the reasons why I didn’t want to go on an expedition or buy another necklace. It’s not my first inclination to walk away from someone talking to me, but I soon realized they would keep talking and talking unless I learned to say, “No, thank you,” with a smile and keep walking or turn away. A long stretch of beautiful Bávaro Beach was about five minutes (eight with the toddler) from the door of our room. 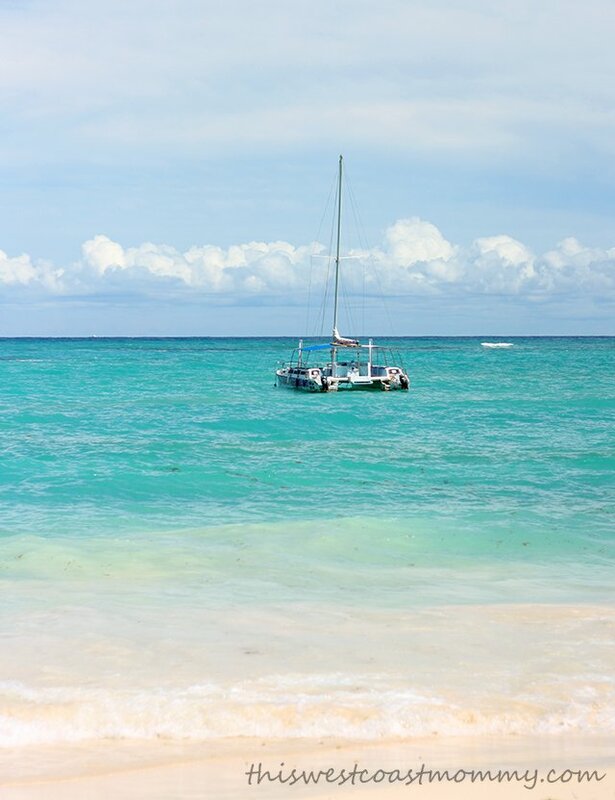 When you think of a Caribbean beach, this is it. Soft, white sand and stunning, turquoise waters. There was also a fair amount of seaweed on the beach at this time of year. I saw workers cleaning and grooming the beach regularly, but you can’t argue with the tides. Of course we visited the beach several times, during the day and in the evening. I took a couple of brief dips in the warm Caribbean ocean, but my weird children didn’t like the sand sticking to their skin and the waves were too strong for them to play in, so after making a quick sand castle or grabbing a drink at one of the five beach bars, we retreated back to the pool. Older families will enjoy the waves and the warm water, taking a ride on a speed boat, or even parasailing, but my girls were too young yet. When I take a vacation, I’m taking time off from my regular life, and that most definitely includes time off from cooking. One of the best parts about an all-inclusive resort for me is the plethora of food options, and that they all happen without me anywhere near a kitchen! 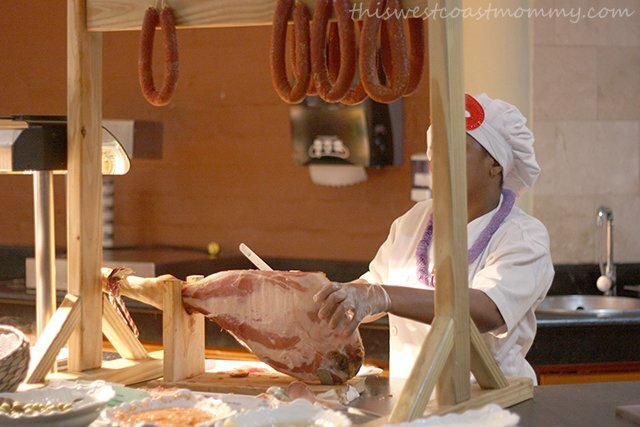 I definitely enjoyed all the not cooking choices available at the Grand Palladium Resort Complex. Whereas most all-inclusive resorts offer a buffet and a handful of a la carte restaurants, the complex had five buffet restaurants including two serving lunch right next to the beach, eight a la carte restaurants in a variety of international cuisines, two more adult only restaurants, and a 24-hour snack bar. I always get nervous taking the kids out to eat at home. Let’s just say by the end of the day, they don’t always appreciate the difference between inside and outside voices, and I don’t want to disturb other diners. That’s not really an option here, because it’s all eating out. We found the staff and the vast majority of the other guests to be kind and understanding. We saw many families with young children there, presumably because of Grand Palladium’s reputation as a child-friendly resort, and on one spectacular occasion watched a set of year old twins fling their plates off the table at virtually the same time. Crash! The staff quickly cleaned it up and laughed it off to the embarrassed parents. 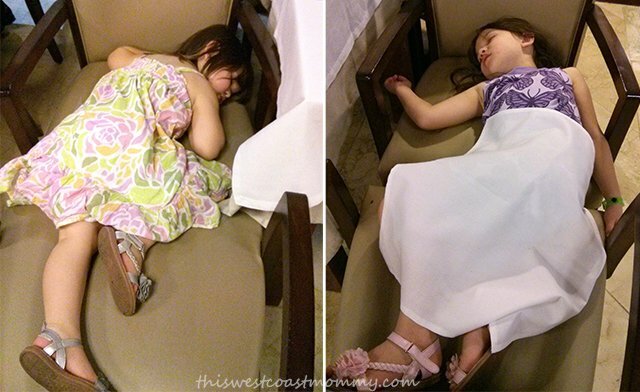 While our kids were slightly more restrained than that, they did have moments where they had a hard time sitting still, and conversely, on more than one occasion, the kids fell asleep at dinner. As in, face down on the dinner table. Playing all day is hard work! The staff were universally kind and understanding, and they were happy to pull two chairs together to make a little bed for them, even at the fancier a la carte restaurants. Unlike other all-inclusive resorts, The Grand Palladium is unique in that guests are not limited to two or three a la carte meals a week. But it is first come first served (unless you go for the VIP package, then you can make reservations every night of the week if you like), so it’s best to go early, right when the restaurant opens. Here’s the complete list of all the restaurants at the Grand Palladium Punta Cana complex. The breakfast buffets always included a custom omelet station, a fresh pancake and waffle station, and freshly made fruit juice. We had lunch at the beachfront buffets most days, sitting on the breezy patio overlooking the ocean. Dinner at the buffet was pretty good too. Of course everyone has different preferences, but there were always lots of choices for all of us, including the kids. Each night was a different theme night, and I enjoyed the build your own salads and fruit bar. I do wish there had been a little more variety in the desserts – it seemed to be a very similar selection of cakes, Jell-o, and fruit most nights. If you get peckish after hours, the sports bar offers fast food type snacks (pizza, nachos, fries, ice cream) 24 hours a day. The Chinese restaurant was under renovations while we were there, and I was sad that we missed the grand opening of the new Indian restaurant by about a month. 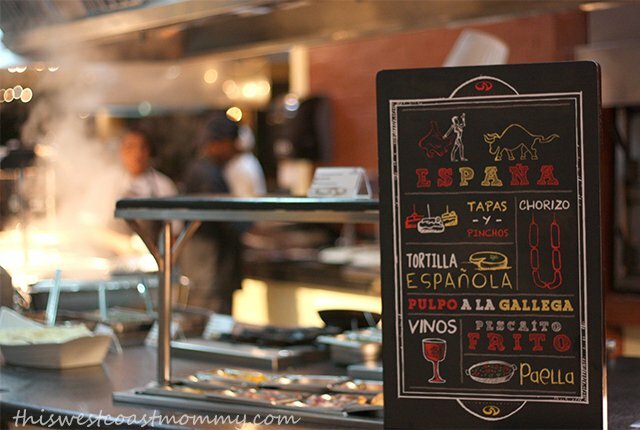 But we had the chance to visit almost all of the other a la carte restaurants during our stay. 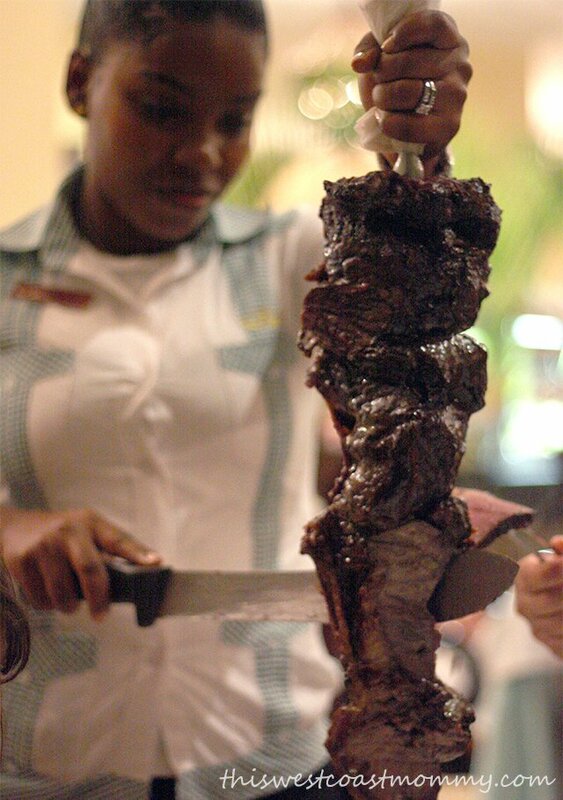 Highlights for us included Rodizio which specialized in Brazilian cuisine and served all you can eat grilled meat on swords: chicken wings and breasts, sausage, pork, beef, and lamb. It was heaven for my carnivore hubby! Our favourite restaurant by far though was Sumptuori which offered a la carte Japanese fare and three teppanyaki tables. 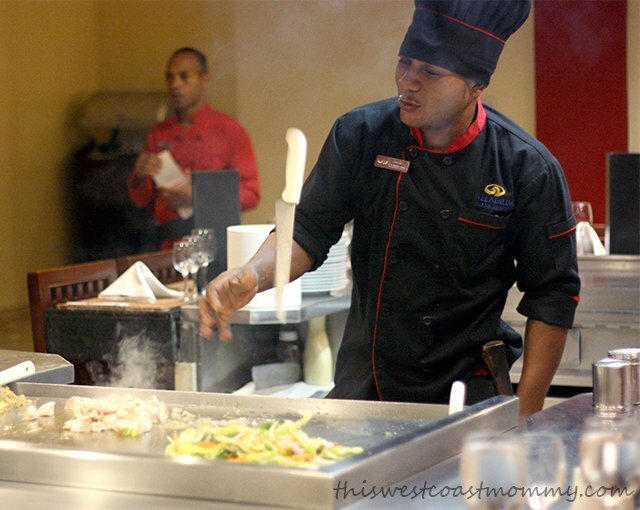 Teppanyaki is a style of Japanese cuisine where the food is cooked on a large iron griddle. The highly trained chefs put on an incredible performance flipping knives, catching raw eggs in their hats, and entertaining the entire table with their fancy knife skills and patter. We went on two different nights because Kay slept through it the first time. Chef Carlos kindly boxed up Kay’s dinner for us to take back to the room so she didn’t go to bed hungry. Hubby and I also visited the Royal Gourmet adults only restaurant at the Royal Suites Turquesa and enjoyed a delicious (and quiet!) lobster dinner without the kids. Now that was nice! Somewhere along the way between five and six, my oldest child became a picky eater. I remember patting myself on the back when she was a preschooler, telling everyone what a good eater she was. What do they say about karma again? Anyway, the kids weren’t exactly adventurous with their food choices. There was a lot of pizza, fries, and mango, and they both had a pancake for breakfast almost every day. There were plenty of kid-friendly choices at the buffets, and the a la carte restaurants all had a separate kids menu with basics like quesadillas, spaghetti, hot dogs, or hamburgers for children uninterested in trying the a la carte options. With fifteen bars scattered across the complex including five kiosks on the beach, we were never far from a drink whenever we wanted one. Staff roamed the pools and lobbies making sure that guests always had a drink to sip while relaxing. Of course, large amounts of alcohol, small children, and swimming pools are generally not a good combination, but the friendly bartenders were just as happy to bring us soft drinks, juice, or a pina colada sin alcohól during the day. The Grand Palladium is a firmly family resort so you don’t need to worry about partiers or drunken idiots. Liquor laws seem pretty liberal here, though the drinking age is 18. 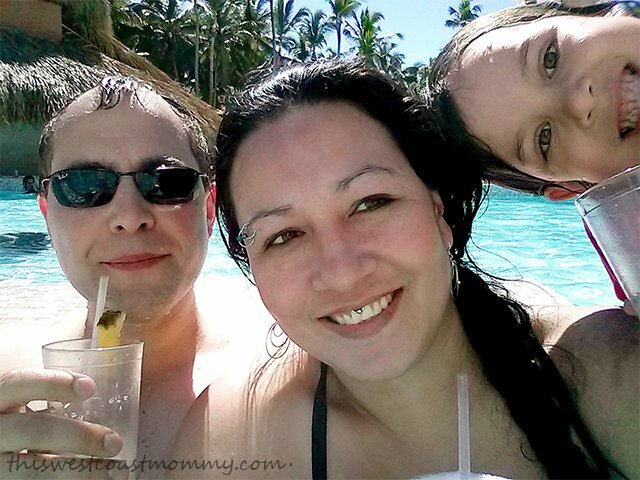 There was never an issue with the kids hanging out at the swim up bar – they loved to play on the underwater stools and enjoy a fruity slushy drink while hubby and I had a pina colada or coco loco. There’s also a bar and stage in each of the four lobbies across the complex, so you can hang out, have a drink, and listen to some live music in the evenings. I know many of my readers have food allergies in their families which can be a significant barrier to eating out. We have some food allergies too – thankfully none of them life-threatening – but when the wrong food could make you critically ill, I can’t even imagine how stressful it must be to rely on others to prepare food for you or your children. But you still deserve a vacation! I had the opportunity to speak with General Manager William Cervera about some of the ways the Grand Palladium makes sure that all their guests are comfortable and safe. 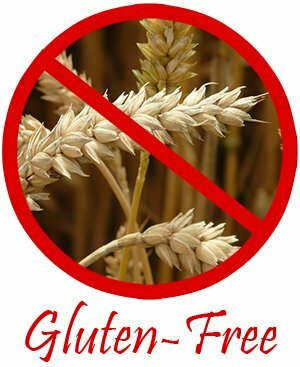 Grand Palladium offers a special gluten-free menu for guests with celiac disease, but of course gluten is not the only serious allergy out there. That’s why when the resort is notified, William arranges a meeting between the family and the chefs to ensure that all the allergy information is passed on accurately. The resort is able to provide a dedicated, contaminant-free cooking area, and guests with allergies are given a special food allergy card to show food staff at the restaurants so you can be sure your meal is safe. I love how the Grand Palladium is working to accommodate all guests, including those with special dietary needs. This is definitely something I would take into account when looking for a resort destination! Head over to Part II of my review to find out about activities for kids and parents at the Grand Palladium. Visit the Grand Palladium website to learn more or connect on social media via Facebook, Twitter, and Instagram. Disclosure: I was provided with a complimentary stay for review. Nevertheless, all opinions expressed are completely honest and my own, based on my personal experience. Your experience may differ. That looks like paradise! Great photos! Thanks, Angela. I can’t wait to go back! Wow, that looks fantastic! My kids would love a holiday like that! This resort looks gorgeous. I love the idea of the kids club so you can get some adult time too. 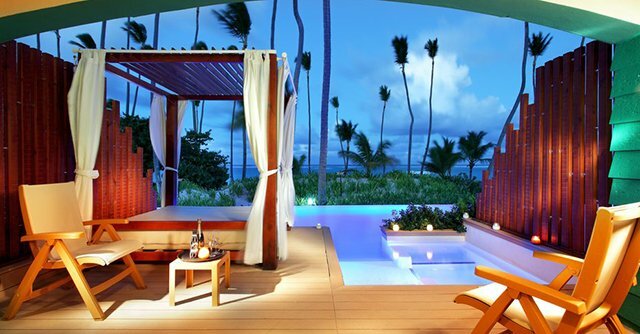 Punta Cana is a place I would love to take my family. I have been to Peurto Plata but I have heard the beaches are nicer on the Punta Cana side. Looking forward to part 2. Yes, having that kids club let us enjoy time with the kids but still get some time to ourselves. It was the best of both worlds! I haven’t visited Puerto Plata, but I imagine anywhere in DR must be beautiful! 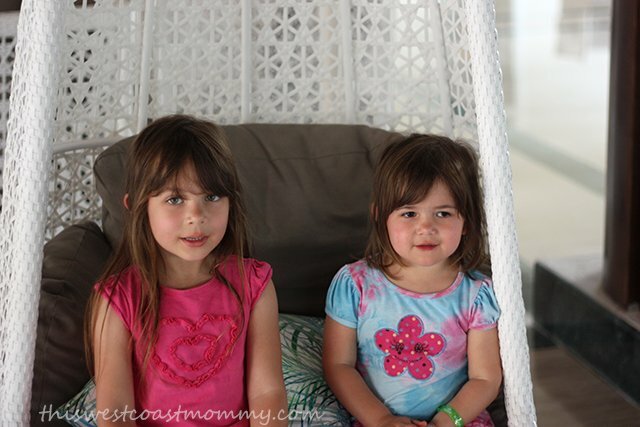 We stayed at the Grand Palladium in the Riviera Maya and it was amazing. There resorts are SO NICE. Your trip looks lovely. Totally agree about the resort. They definitely spoiled us rotten. 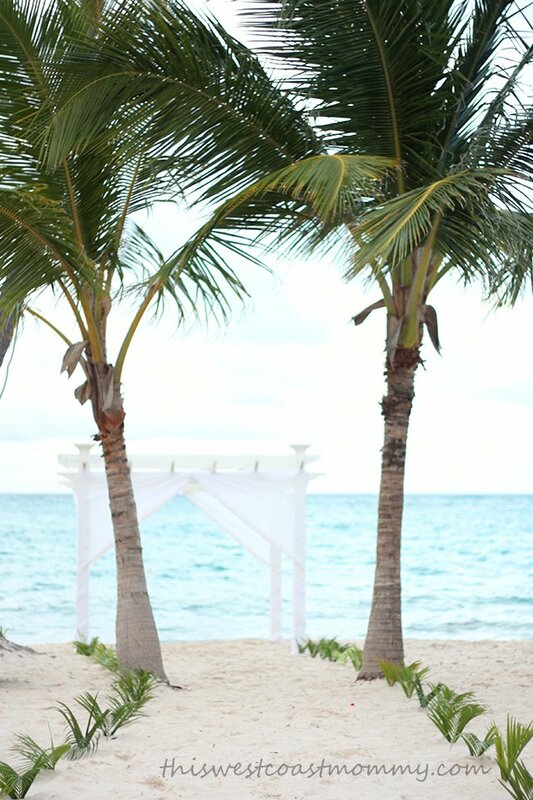 I remember seeing your trip to Riviera Maya – I want to go back one day! We have done some serious research. Your girls look about the ages of mine. 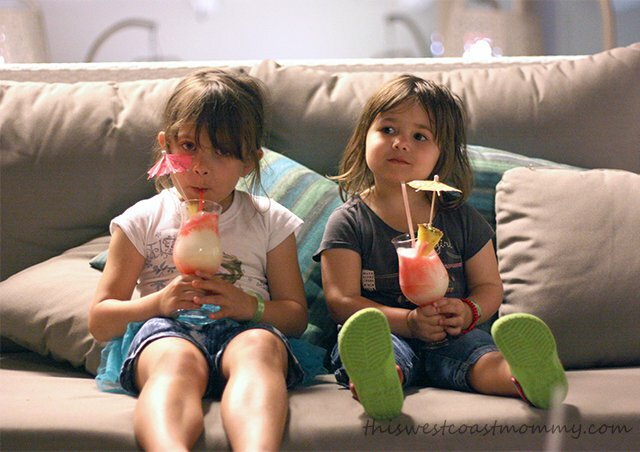 I was worried mine were too young, but I really REALLY want to do a beach get away with these little turkeys before they only want to stare at their iphones!!! Lol, yes mine are 3 and 5. Having the childcare/Kids Club available here made it totally doable with the little ones, and I’m so glad we went. I agree, I want to do as many of these vacations as we can while the kids still *want* to spend time with us. This looks like it was incredible. I would love to stay in a room with a private pool! We’ve considered taking our kids with us on our next trip to Mexico but we haven’t decided whether or not we want to yet. Our 7 year old really wants to go to Mexico but the younger ones don’t care too much and may actually prefer staying at Grandma’s! We walked past those rooms on the way to the beach and they looked incredible! Probably best for families with slightly older kids I would imagine though. Don’t want babies falling in! If you’re lucky enough to be able to leave the kids with Grandma for the week, go for it! I think it would be awesome to convince my parents to go with us an then we could all get a vacation somewhere warm and I wouldn’t miss my kids so much! Wow, those pictures are amazing! Like you, its been nine years since we’ve vacay’d, which was during our honeymoon too. Really hope to go somewhere next year, and this place looks perfect! 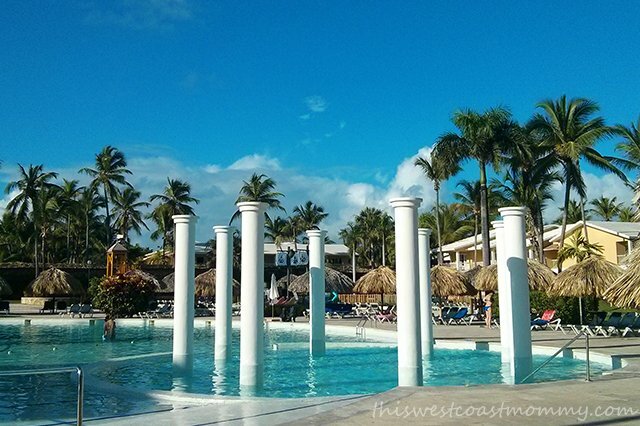 I would totally recommend the Grand Palladium resorts! Isn’t it scary how the time gets away from you? All of a sudden it’s NINE years since a vacation! Too long! Our travel budget gets spent mainly visiting family, but we did take our son to a Mexican resort when he was 6 months old. Because my parents were there and he was nursing, we didn’t need a Baby Club. Now that he’s three, I wouldn’t spend the money to go to a resort UNLESS they had some form of childcare that included his age group! 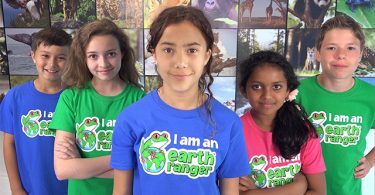 I’m psyched to hear how the girls enjoyed their activities and what you did on your down time! That makes sense with an infant that you can keep close by. Once they start moving and getting into trouble though, yeah, I wouldn’t go anywhere without a Kids Club either. Thank you for this. We’ve been trying to figure out where to go on vacation with two little ones. I’m looking forward to your post on what kids can do there. It looks you had a fabulous vacation with your family! The resort looks like it would be a lot of fun, and I’m happy there are a lot of things for kids to do. Thanks for sharing this review with us! I am drooling. So much to choose from – I wouldn’t know where to start! 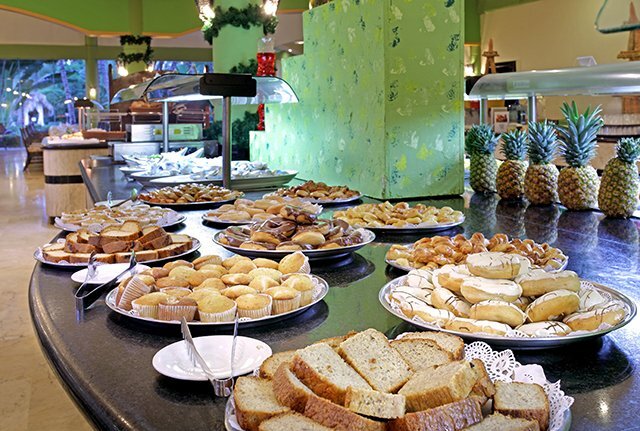 The breakfast buffet is my absolute fave – I would be in heaven over there! I always love vacay away from cooking and the dishes. And your makeshift dinner bed is amazing. I wish my little mama would stay like that over dinner!! It is always so much fun to get away for some rest and relaxation and the Grand Palladium Resort Complex looks like the perfect place to do just that. Although my kiddos are grown up now, I think it’s great that this resort welcomes families with young children. I love eating out and trying different cuisines. The Trattoria Chef Raffaelle and El Tapeo Restaurant would absolutely be on our must try list. I wish somehow I could stay where I want to live but have a good beach closer! Just gorgeous! I hear you on the learning to say no to salespeople. I wish our family could go there sometime. We honeymooned in the DR. This post brought back some great memories! Looks like a lot of fun. I think this is our next vacation! Amazing vacation. I love to stay at this resort. Everything is perfect for parents with kids. I hope my dream comes true of one day I get to travel with my two daughters. This place looks amazing, I don’t know if the pictures were done by you or if they were provided but they’re beautiful. I want to be there ! I appreciate your review of the resorts…I’ll keep them in mind when we plan a vacation in Mexico. Awesome looking place I want to enjoy with my family in the near future. I would absolutely love taking a ride in a speedboat there versus boating on Alberta lakes! What a vastly different experience that would be! Oh I can hear the waves now! 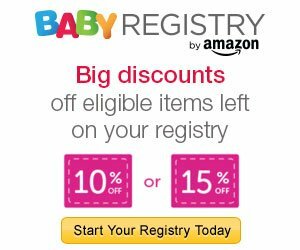 Do you recall if there are any places to nurse an infant? 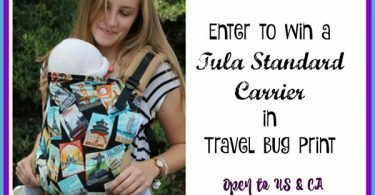 Traveling with a four month old in July. I’ve heard the grounds are expansive and also have a 5 and 3 year old so I don’t want to go back to our room every time I need to feed. Thanks! My boys (3 & 5) love Raggs. I didn’t even know this kind of thing existed. We’re looking at going to the Dominican Republic in the spring and wondering if there is a lot for the 3yo to do at this resort? Thank you!